The method of transcribing the Lotus Sutra inone day as well as the other method of doing it according to a certain style are valid practice, which are clearly described in the Lotus sutra. Both of these, however, are the practices of shōju, appropriate for the bygone ages of the Former and Middle Days of the Law. They are based on [ the theoreticalteaching of ] the Lotus Sutra. Now in the age of the Latter Day of the Law,from the standpoint of practicing shakubuku, reciting the entire sutra is not the primary practice. One must chant only the Daimoku of the five characters and refute the heretical teachings expounded by the priests of other sects, no matter how severely the three powerful enemies may attack him. This instruction clearly is expounded in the Encouraging Devotion and the Bodhisattva Never Disparaging chapters of the Lotus Sutra. And this instruction was proven to be valid by Bodhisattva Jōgyō, who has actually propagated the Law. One must understand the time and capacity in order to appropriately select among the four ways of teaching and the two methods of syōju and shakubuku. One must not be attached solely to one or the other. Fundamentally, there is no advantage or disadvantage in using Sanskrit, Chinese,or Japanese, since there languages, were used according to the time and the people’s the capacity. However, when I deeply consider Nichiren Daisyonin‘s insightful ways of leadingthe people to Buddhahood, I find that they surpass the other expedients that were taught in Sanskrit or Chinese. 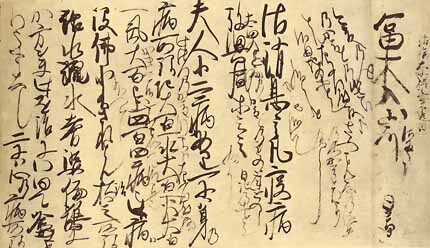 Why should one always value Chinese characters while looking down upon the Japanese written language? Of course, when Buddhism gradually spread from India to the East, it was translated from Sanskrit into Chinese and Japanese, and then introduced to these countries. In the same way, at the time of kōsen- ruhu, the golden words of the Daishonin that were inscribed in the Japanese syllabary (kana characters) also must be translated into various languages and propagated throughout China and India. In order to spread the Law far into the future, the Daishonin’s words must be translated into different languages. This is a matter of course, I alone, however, feel grief to the arrogant and intentional distortion of the Daishoninn’s original words. Shyakyamuni Buddha expounded the theoretical and essential teachings of the Lotus Sutra to bestow the benefits of maturing and harvesting on the people [during his lifetime and after his death]. They are, however the theoretical teachings. On the other hand, Myoho [-Renge-Kyou] at the stage of first hearing the name of the Law in the infinite past of kuon ganjo, is the essential teaching. When a common mortal single-mindedly chants Nam-Myoho-Rnge-Kyo with strong faith, he will become a Buddha.